Join us at our annual German Fair for a morning of Teutons, Fritzes and Kraut! Spoil your taste buds with German baking, sausages, Brezeln, German style potato salad, sauerkraut and other goodies. Hunt for amazing bargains at our second hand sale of children's toys, clothes, books and more! Wear your Dirndl and Lederhosen if you dare! 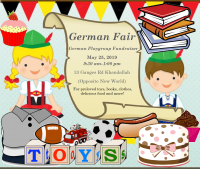 All proceeds go to the German Playgroup Wellington. Original generation time 2.4943 seconds.